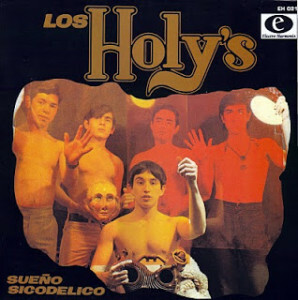 Los Holy’s was an instrumental band out of Peru who formed in 1966. The band recorded one LP and several singles, and are considered to be among the first rock groups to experiment with psychedelic rock, surf rock, and beat latin. Members included Marcos Goyzueta (lead guitar), Arturo Matto (rhythm guitar), Oscar Saenz (bass), Renzo Carozzi (farfisa organ), and Walo Carrillo (drums). Initially known as the Sharks, the band formed in late 1966 by friends who were studying at GUE. Bartolomé Herrera in the district of Pueblo Libre. Upon finishing school, the band changed their name to Los Holy’s. Their first single, “Holy’s Psychedelic” / “Ginza Lights,” was recorded on the Dinsa/Success label, founded by Alberto Maravi. When it came to the band’s album, there were moments of tension between the members. Their manager and Carozzi wanted to record a more traditional album, whereas Walo, Goyzueta, and Saenz wanted to record something that was more along the lines of bands like Cream.